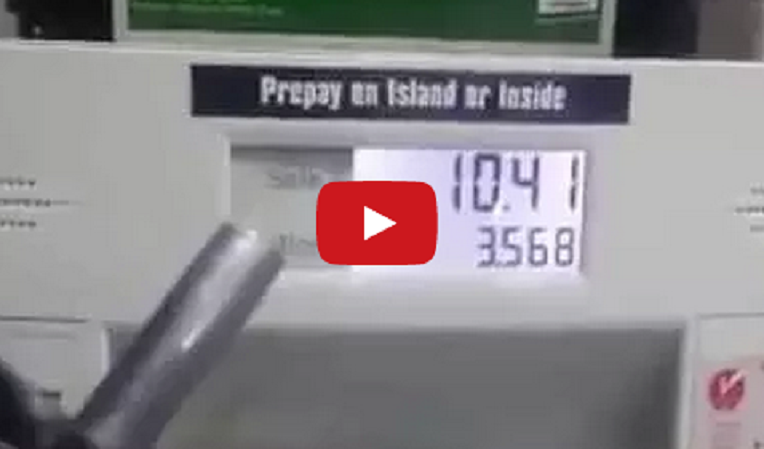 [VIDEO] Rigged Gas Pump Cheats Man As Meter Rolls, But No Gas Is Pumping Out. Previously we brought you a story that alerted consumers that 3 out of 4 gas pumps in America are rigged to give you LESS than what you are paying for. We Now Have PROOF! A Las Vegas man, James Hern, posted a video this week as he was attempting to fill his gas tank at an AM/PM gas station. The gas station is located in North Las Vegas on the corner of Ann Rd and 5Th St.
Hern paid for his gas, lifted the nozzle and before he could even put it in to his gas tank, the meter started moving. That’s when he began filming the incident. The bill went over $10.00 and he did not even pump one drop of gas in to his tank. Stuck In An Elevator With A Crazy Person – What Would You Do? Gay Guy Calls Westboro Baptist Church, And I Can’t Stop Laughing!